This week's Sunday Night Suds looks at Samuel Adams Dark Depths Baltic IPA. Nearly one year ago, Samuel Adams began rolling out their Single Batch series which included many interestingly named brews. However, not much was known about these beers' relative kashruth until recently as the Star-K did not update their October 2011 LOC for Samuel Adams(which predated the introduction of these brews) until June 2012. However, the June 2012 LOC does indicate that many of these 22 oz "Single Batch" beers are under hashgacha, including the aforementioned Dark Depths, as well as: Norse Legend; Tasman Red; Vixen and Verlorean. The "Single Batch" styles sell at a premium as compared to the standard Sam Adams brews and I have found that many beer stores will charge different prices for each kind of beer. In fact when my wonderful aishes chayil picked this up for me at the upstate beer authority known as Sam the Beer Man in Binghamton, she remarked that many of the beers had different prices on them. I was later able to confirm this myself when I saw many of the brews at DeCicco's in Brewster. Actually, I need to digress for a moment as to the oversized bottles and why this became an issue. In early winter 2012, Saranac released its High Peaks Chocolate Orange brew. I looked high and low for this beer, before finding out that Manhattan Beer (the middleman which distributes Saranac products from Delaware County down to Long Island) did not carry this brew. However, Sam the Beer Man did carry it and Mrs KB was nice enough to pick up two bottles of it earlier in the summer on one of her rare days off. I was quite excited to see the beer when I came up to Camp M, but then I realized that it did not have a kosher certification mark from the Va'ad of Detroit. It also indicated that it was made by Saranac in Boston, Mass and this was also puzzling to me as I thought that Saranac only brewed in Utica. After a little digging and with some invaluable information provided by the KCOR, I learned that the beer was made in the Harpoon factory in Boston and that while all the ingredients were purportedly obtained from kosher suppliers, the Va'ad of Detroit was unable to certify the High Peaks Chocolate Orange as kosher, due to the lack of knowledge of the production activities at Harpoon and the inability to ascertain whether there could be cross contamination (in the kosher sense, not from a hygienic standpoint). As such, I learned that again, every rule has an exception and not every beer made by Saranac is certified kosher. Armed with this knowledge and with Mrs KB on her second day off this summer and planning to shop in Binghamton, the exchange was made at Sam's of two oversized Saranacs for two 22oz Sam Adams brews. 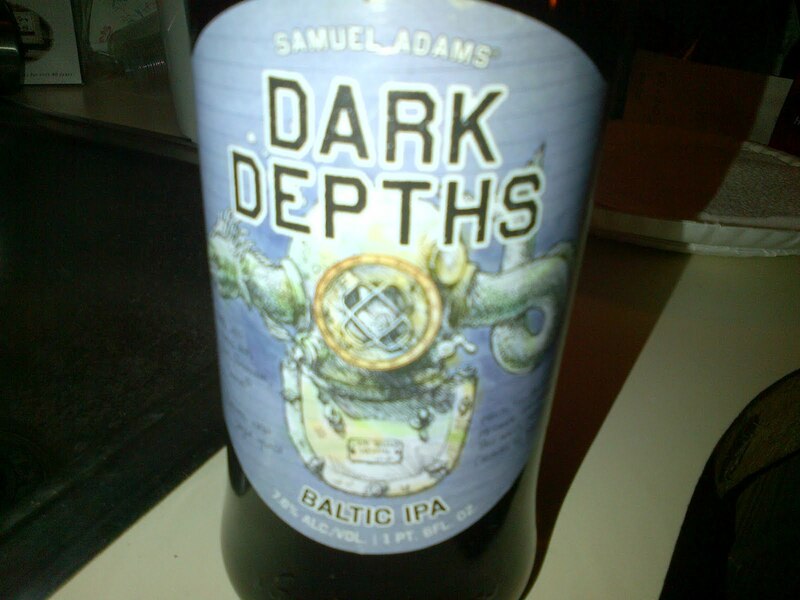 So by now I am sure that you are bored to tears and wondering what the Dark Depths Baltic IPA tastes like. The answer is, a cross between an IPA and a stout which really meshes quite well. I shared the Dark Depths with Mrs KB and Rabbi Andrew K and James S on Friday Night at a mini tish that we organized. The hops were prominent, but we were all quite impressed by the richness of the brew and the malt which added complexity to the flavors. Each sip produced evoked different taste profiles which were not influenced in any manner by the brew's 7.6 abv. This is a beer which belongs at a shabbos table and would go very well with most Friday Night shabbos fare (after the soup or fish that is). The Samuel Adams Dark Depths Baltic IPA is under the Kosher Supervision of the Star-K. Like many other Samuel Adams brews, this bottle does not have the Star-K certification mark on the label. To see what the experts on Beer Advocate think about the Dark Depths, please follow this link - http://beeradvocate.com/beer/profile/35/77234 . Mrs KB liked your post (and the Beer)!